The Annapolis Valley and western Nova Scotia have reported positive captures (low levels) in fields, field borders and hedge rows over the past month. Last week, Peter Burgess, Perennia's Wild Blueberry Specialist reported their first positive capture in Central NS in a hedgerow. "We had our first positive capture in Central NS in a hedgerow. We found 1 male fly, in one of our traps. The trap is not in a wild blueberry field. This capture is expected based on what we have seen in previous years. We expect to see sporadic, low level captures over the next couple of weeks. Historically, we have not seen SWD populations increase rapidly until we get into September, and based on what we are seeing, this is what we are expecting this year, for central and Northern NS. Growers with later harvest fields should consider monitoring those later fields." 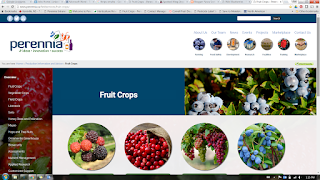 It has a brand new look and even a page dedicated specifically to Caneberry Production. When you have the opportunity please check it out!